The ASA-Calgary Centre would like to invite you to our free walking tour of Edworthy Park on Sunday, September 23 from 10:30-12. Join us for a fun, informative ramble through the ages to reveal the unique facets of one of Calgary’s recreational gems. We’ll be exploring the fascinating geological, archaeological and historic past of this popular spot and learn why it has been a local hot spot for many millennia. Glacial lakes, stone circles, and sandstone quarrying are just a few of the topics that will be covered. Space is limited so please preregister to attend. Preregister by e-mailing info@arkycalgary.com. Registrants will be emailed with more appropriate parking info, map, etc. We are back with our Lecture Series starting September 19th, 2018. Title: Archaeological Survey, and a UNESCO World Heritage Nomination, for Writing-on-Stone Provincial Park. Writing-on-Stone Park (WOS) is home to one of the largest collections of rock art (petroglyphs and pictographs) in North America. Spread over a vast region of the Milk River valley and tributary coulees are thousands of carved and painted rock art images. So important is this rock art and associated landscape that the Park area has been proposed for designation as a UNESCO World Heritage Site. This nomination is currently under consideration. In anticipation of the nomination Alberta Parks acquired two new parcels of land located along the Milk River to the west of the current park. In total some 14 quarter sections were acquired. I volunteered to conduct an initial archaeological review of these new lands in order to give Parks a better understanding of heritage resources on their property. In this talk I will discuss the results of these surveys, including new discoveries of rock art, historic graffiti, archaeological and historic sites. In addition, I will provide an inside look at the UNESCO nomination process that took 13 years to complete. Please join the McDougall Stoney Mission Society on July 7 at 11:00am or 2:00pm at the McDougall Memorial United Church Site for a site tour and talk with Dr. Margaret Kennedy. There will be two tours, so choose the time that works best for you! Dr. Kennedy led a detailed archeological study of the Morleyville Mission settlement in 1984 and 1985, and will share her findings and interpretations of what she found at one of southern Alberta’s most significant historic sites. We will walk around the lower ledge where she did the excavation, so please wear walking shoes and dress for the weather. A great learning opportunity for all ages! Pack a picnic if you like, it’s another great way to enjoy the site! Admission is by donation. They are a non-profit society and depend on your donations to keep providing these informative sessions at the site. 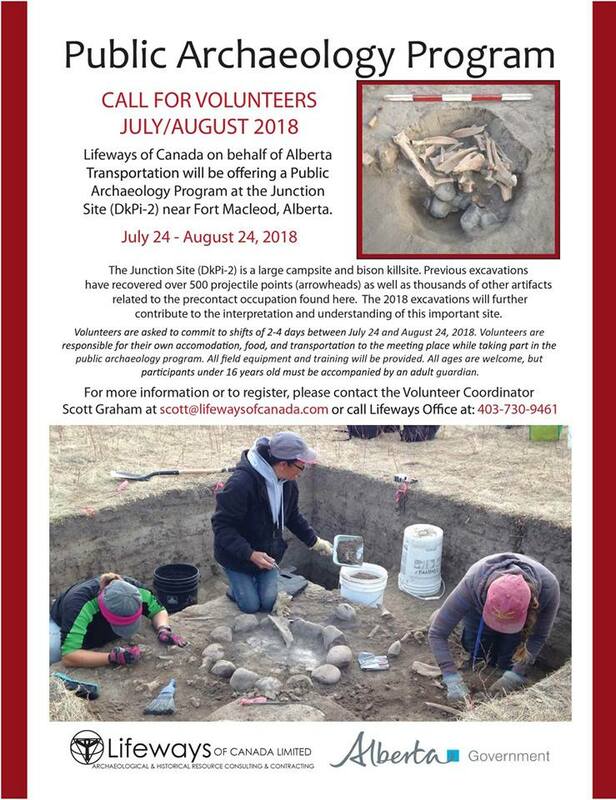 Lifeways of Canada on behalf of Alberta Transportation will be offering a Public Archaeology Program at the Junction Site (DkPi-2) near Fort Macleod, Alberta. The Junction Site (DkPi-2) is a large campsite and bison killsite. Previous excavations have recovered over 500 projectile points (arrowheads) as well as thousands of other artifacts related to the precontact occupation found here. The 2018 excavations will further contribute to the interpretation and understanding of this important site. If you are unable to attend the volunteer excavations at Cluny, do not worry! The ASA is having a special tour on Saturday, June 16th at the Cluny Fortified Village. Find out how the site is shaping up this season and checkout the amazing interpretive center at Blackfoot Crossing. There is a small fee for the interpretive center that must be paid to also visit the archaeological site. Weather is always changing so prepare to dress accordingly. Also, we suggest you pack your own lunch and water as there will not be any provided. Please join the Archaeological Society on a field trip to the UNESCO World Heritage Site, Head-Smashed-In (HSI) Buffalo Jump on Saturday, June 2nd. Bus will depart from south end of Calgary at 7:45 am. Expect to be back in Calgary around 5:30pm. The field trip will include a walking tour of the drive lanes at HSI; we encourage wearing sturdy footwear and to dress appropriately for the weather conditions. There is no cost for the field trip thanks to a generous donation from Plains Midstream. The trip is limited to 48 participants and registration will be on a “first registered first served” basis. Preregistration is required to attend. A wait list will be compiled if necessary. Once registration is confirmed, a map will be provided to the bus meeting place. **Please note that lunch and water will not be provided. *** We suggest bringing a bag lunch as we will be touring the drive lanes over lunch. The University of Calgary is offering a volunteer excavation program at Blackfoot Crossing Historical Park this summer. Participants will excavate alongside members of the Archaeology Field School at the famous Cluny Fortified Village site. First time participants will receive a tour of the archaeological site. Volunteers will be supervised by experienced University of Calgary graduate students. Training in archaeological excavation techniques will be provided on site. All artifacts from the site are the property of the Siksika Nation and, ultimately, will be stored at Blackfoot Crossing Historical Park Interpretive Centre. The program will operate from May 22 to June 22, 2018, Tuesday–Saturday. Cost consists of the daily admission fee to Blackfoot Crossing Historical Park ($12.00 + GST for adults, $8.00 for children). Participants will meet with volunteer program supervisors at the Blackfoot Crossing Historical Park Interpretive Centre parking lot at 9:00 AM each day—please note that there are no overnight accommodation facilities at the park. Participants under the age of 18 must be accompanied by a responsible adult at all times; the minimum age requirement is 12. All participants will be required to complete a Volunteer Liability Waiver Form and a Photography Waiver Form. Participants under the age of 18 must also complete an Informed Consent Form. Check out our Facebook Page (University of Calgary Public Archaeology Program – https://www.facebook.com/UCpubarky) and our website (https://antharky.ucalgary.ca/public-archaeology/) for updates. Please email pubarky@ucalgary.ca or call 403-220-8537 to register or for further information. ASA – Lethbridge Center requires volunteers to aid in the mapping and recording of approximately 50 stone circles at a previously recorded site along the Little Bow River. Dr. Peter Dawson from the University of Calgary will be joining and demonstrating the use of drones with multi-spectral imaging to map the site and help locate other rings that may be hidden. Tree Time Services Inc. is sponsoring the Archaeological Society of Alberta’s (ASA) public survey of the Brazeau Reservoir. TTSI team members and volunteers from the ASA will be on hand to lead a survey and teach people how to spot artifacts in the exposed sands. In past years, people have found many projectile points, boiling pits, and ancient horse fossils.